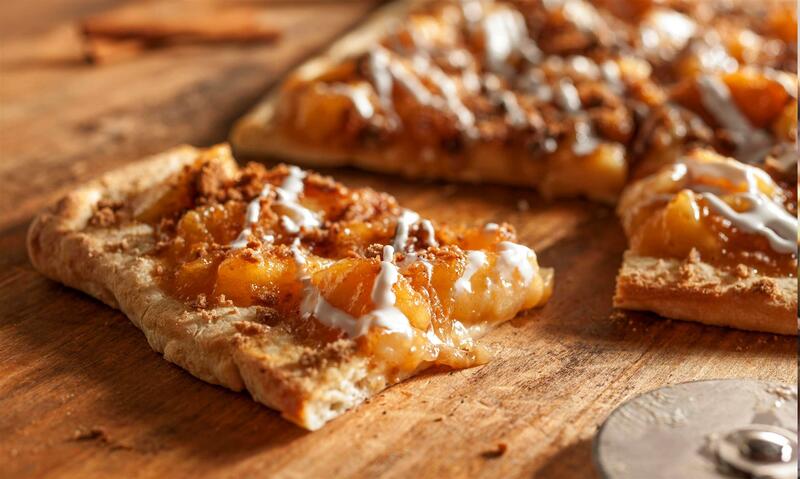 Who said you can’t have pizza for dessert; this dessert pizza offers all the delicious flavors of an apple pie using our Glazed Apples. Follow the instructions for the prepared pizza dough and place onto greased cookie sheet or 12” pizza pan. Prepare the streusel by combining all ingredients into a bowl and crumble using pressing motion with a fork until streusel crumbles are the size of a pea. Prepare the vanilla cream cheese icing by placing the softened cream cheese and sugar into a mixing bowl and beat the cream cheese using an electric mixer until the sugar is fully incorporated. Slowly add the vanilla and milk and mix until fully combined. Add more milk if necessary to get desired consistency and thickness for drizzling on top of the pizza. 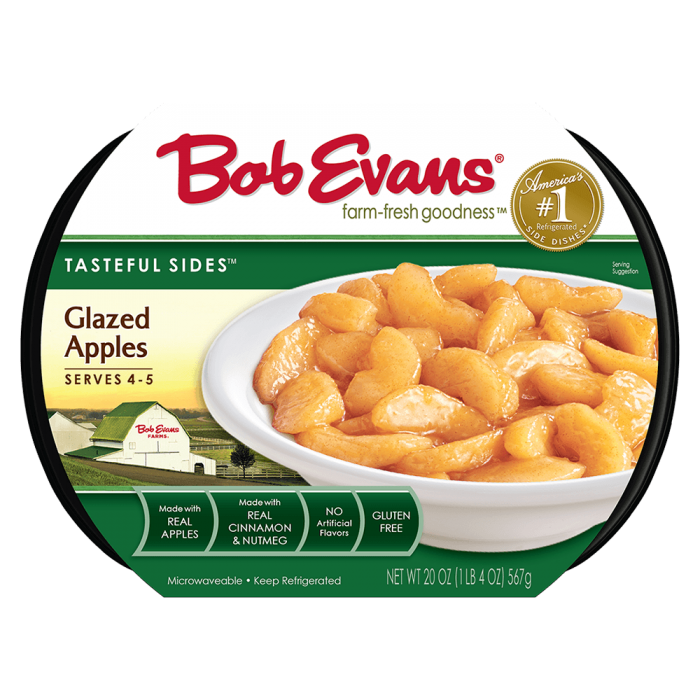 Scoop the entire package of the glazed apples and spread evenly on the dough, leaving 1” around the edge clear for the crust. Evenly sprinkle the streusel over top of the apples. Bake the pizza until the crust and the streusel is golden brown, about 12 to 15 minutes. Let pizza rest for 5 minutes before icing. Stir icing and drizzle on top of pizza to garnish. Cut into 8 slices. 1 Preheat the oven to 425F. 2 Follow the instructions for the prepared pizza dough and place onto greased cookie sheet or 12” pizza pan. 3 Prepare the streusel by combining all ingredients into a bowl and crumble using pressing motion with a fork until streusel crumbles are the size of a pea. 4 Prepare the vanilla cream cheese icing by placing the softened cream cheese and sugar into a mixing bowl and beat the cream cheese using an electric mixer until the sugar is fully incorporated. 5 Slowly add the vanilla and milk and mix until fully combined. Add more milk if necessary to get desired consistency and thickness for drizzling on top of the pizza. 6 Scoop the entire package of the glazed apples and spread evenly on the dough, leaving 1” around the edge clear for the crust. 7 Evenly sprinkle the streusel over top of the apples. 8 Bake the pizza until the crust and the streusel is golden brown, about 12 to 15 minutes. 9 Let pizza rest for 5 minutes before icing. Stir icing and drizzle on top of pizza to garnish. Cut into 8 slices.